Biotechnological medicinal products offer great opportunities for up to now incurable diseases. Hence, they represent nowadays a significant and growing market. Nevertheless their heterogeneity still remain a big challenge. A major challenge with biopharmaceuticals is their heterogeneity. In contrast to chemically synthesized drugs, each process generates a unique product, even if it is the same protein. Regardless of whether they are biotechnology-­derived or chemically synthesized, the criteria of Good ­manufacturing practice (GMP), Good Clinical Practice (GCP), Good Quality Practice (GQP), Good Regulatory Practice (GRP), Good Vigilance Practice (GVP) and Good Documentation Practice (GDP) are crucial regulations in drug manufacturing processes. These GxP-regulations are basically the ground for ensuring the quality, efficacy and safety that are required for medicinal products. The mechanisms of control and measures for ensuring drugs quality currently start at a very early stage of the product development. Accordingly, given the expectations of the detailed guidelines, the development of excipients, active ingredients and intermediates must be handled in accordance with the overall GxP criteria enabling a high level of conformity. 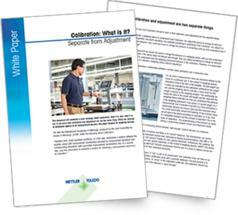 This GxP conformity is followed by a stringent GxP consolidation as regards the products that are on the market considering ­all starting materials, solvents, as well as all systems and related activities in connection with the drug manufacturing process. These encompass all kind of technical agreements like e.g. those with contract manufacturers as well as transport activities and storage conditions from the raw materials to the finished products, since they all can alter significantly the characteristics of the active ingredients, intermediates and finished products. Therefore the GMP conformity, and later on, the consolidation comply with the need for ensuring consistent quality during the shelf life of the products. However this remains a real challenge with respect to biopharmaceutical medicinal products, the main problem being the complexity in handling with biologicals in general. As the result of their heterogeneity, the development of these biodrugs requires test methods and relevant processes that are system specific taking into account their specific interactions and pharmacological effects within a given biological system . Fig. 1 Significant steps for QbD in the manufacture of biological pharmaceuticals . The Target Product Profile describes the therapeutic use, efficacy and safety. Aspects of quality, safety and efficacy during development are taken into account in determining TQPP. The solution to the above problem is currently provided by Quality by Design (QbD) a systematic approach, in which the quality of products is built in the product, prospectively, that means along with the product definition – in other words, quality is “designed much in advance”. With the implementation of the QbD concept, conditions for manufacturing are ideally pre-defined and set so that quality control is driven to a “just in-time” and proactive way of monitoring ensuring efficiently the quality of biodrugs. Proactive quality assurance requires (as one would expect) in-depth knowledge of all products and processes associated with development, as well as with manufacture at laboratory and production scale. This level of ­knowledge allows pharmaceutical quality to be monitored, documented and improved proactively, conti­nuously and in perspective, so that sustainable therapies can be developed for the treatment of severe and rare diseases. It is important to establish effective systems and structures that enable smooth implementation and standardisation of risk-based procedures as required by the guidelines of ICH Q9 (Quality Risk Management)  and ICH Q10 (Pharmaceutical Quality System) . 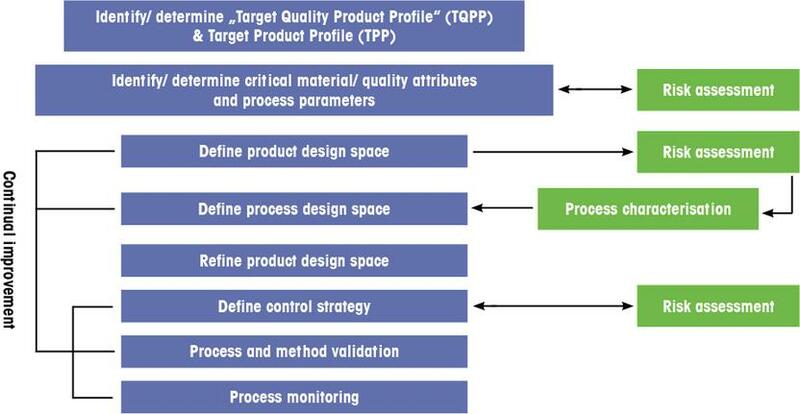 The QbD principle is based on a loop system, which incorporates the design, analysis, monitoring, as well as the tracking and control of critical quality attributes and performance characteristics of products and processes (Fig. 1). This is associated with a real time data analysis, risk-based assessment and validation of manufacturing processes and products from raw materials to finished products, from the research and development to the production in the post-marketing phase. Tools and models are used in pharmaceutical QbD that have proven their value in engineering over many years. These relate to the development of product quality with the Six Sigma model and use of a multidisciplinary tool referred to as PAT (Process Analytical Technology). PAT is used as a technology platform as well as a regulatory option. With the introduction of such tools and models the development, the manufacture and scaling-up procedures during the production of medicinal products, should become more flexible and highly efficient without affecting the product quality, with respect to their intended use. 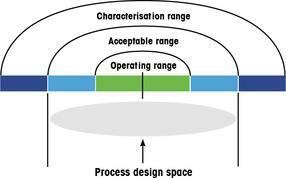 This is done by establishing a clearly defined operational space (Design Space, Fig. 2) right from the beginning, in which each source of variability can be controlled so that consistent quality can be guaranteed. a way that even in the context of clinical trials, identi­fication of critical quality attributes and relevant process parameters within the clinical designed space and finally the identification of sources of variability, are at least high priority in view of getting an approval for marketing authorisation enabling a faster time to market and an effective product maintenance later on. It follows that understanding, analysis, monitoring, and validation are more important than theories and pure testing. A practical example shows why the QbD philosophy is worthwhile and forward-looking in the manufacture of biodrugs. Fig. 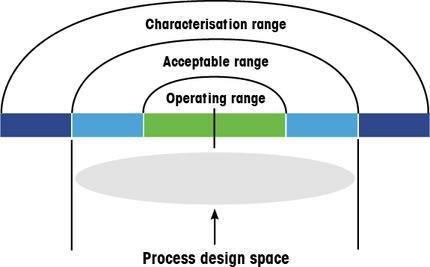 2 Design Space of a process: Those processes and material attributes that are critical for quality are correlated in the design space. This delimits a zone in which pharmaceutical quality is manageable and not exposed to wide fluctuations [4, 5]. With the establishment of a design space, a framework for sustainable quality is defined in advance. the “first-in-class”. The antibody that was used was a humanized mouse antibody, that means that human sequences were inserted into the mouse antibody framework so that a human immune system would recognise it as a human antibody. It was soon tested in patients. Meanwhile, further meta-analysis of the AN-1792 clinical trial data showed that the surviving vaccinated patients lost their memory and cognition just as quickly as unvaccinated patients. Bapineuzumab showed similar poor results on cognition in phase II, but still convinced as it dissolves the pathological brain deposits and so a phase-III trial was approved. Unfortunately, patients with Alzheimer‘s do not only have amyloid-β plaques in the brain tissue but also in blood vessels - particularly in the small vessels of the brain. An intact monoclonal therapeutic antibody does exactly what an antibody has to do, regardless of whether it is produced as a pharmaceutical or made by the immune system: it binds the structure against which it is specific (in this case, the endogenous amyloid-β) and signals to the immune system that it has found something that apparently does not belong to the organism. Genetically engineered antibodies produced for therapeutic purposes do exactly the same, as long as they are intact molecules. Bapineuzumab is an intact antibody, and therefore also recognised the plaques in the blood vessels of patients treated with Bapineuzumab. The immune system recognised the bound antibodies and destroyed the blood vessels assuming that these structeres were pathogens since an antibody was bound. Destroying brain vessels caused a dangerous cerebral oedema in some patients in the group with the highest dose. A subsequent re-investigation in an appropriate animal model with vascular plaques confirmed what was seen in patients. Therefore the highest dosing group in phase III was ommited, the lower doses are better tolerated and will be further investigated in clinical trials. What lessons did we learn from that? Is there no hope for a vaccine against Alzheimer‘s? The answer is: Yes and No. Bapineuzumab has been treated in the press kind of the bad guy, it has taken the blame. However, the fast-followers (monoclonal antibodies agaist amyloid-β from other companies) show similar dissapointing outcomes, but still allow some hope for the future. For example, solanezumab from Eli Lilly, which does not bind to plaques in the blood vessels, though cerebral oedema of uncertain origin was also reported for solanezumab in early 2011. Data from testing the memory performance of the test persons is not expected until 2012. Then there is also the use of IVIG, an antibody cocktail that is isolated from the plasma of healthy donors, which appears to delay memory deterioration in Alzheimer‘s patients. Sahoo N., Choudhury K. & Manchikanti P., Manufacturing of Biodrugs: Need for ­Harmonization in Regulatory Standards. Biodrugs 2009; 23(4):217-229. ICH (International Conference on Harmonisation) Guideline, Q 9 „Quality Risk ­Management“, EMA/INS/GMP/79766/2011, Februar 2011. ICH (International Conference on Harmonisation) Guideline, Q 10 „Note for Guidance on Pharmaceutical Quality System“, EMA/INS/GMP/79818/2011, Februar 2011. Rathore A. S., Winkle H., Quality by design for biopharmaceuticals: The US Food ­­and Drug Administration’s ‘quality by design’ approach is likely to transform the manufacture of biologics. Nature biotechnology 2009, 27 (1): 26-34. Hallow M., Muddryk B.M., Braem A. D., Tabora J. E., Lyngberg O.K., Bergum J.S., ­Rossano L. T., Tummala S., An Example of Utilizing Mechanistic and Empirical Modeling in Quality by Design. 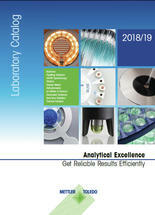 Journal of Pharmaceutical Innovation 2010, 5 (4): 193-203. First publication: Mavoungou, C., Zimmermann, K., q&more, 1.2011.